MPG-o-Matic 2011 Ford F-150 EcoBoost Review Summary: With the F-150 EcoBoost, Ford has wagered that America will accept a V6 engine in a full-size pickup truck. They haven’t just bet big, they’ve bet smart. The turbocharged, direct-injected EcoBoost engine rewrites the rules of the game. While the 2011 Ford F-150 is available with four different engines – from a 3.7-liter V6 through a 6.2-liter V8, the new EcoBoost V6 is the hot ticket, with its winning combination of power and fuel efficiency. The 3.5-liter turbocharged and direct-injected EcoBoost engine produces 365 horsepower (HP) and 420 foot pounds of torque. All 2011 F-150s are exclusively fitted with electronic six-speed automatic transmissions with overdrive. A manual transmission is not available. The F-150’s gas mileage ratings have taken a significant set up, with the official fuel economy estimates for the 2011 EcoBoost Ford F-150 coming in at 16 city / 22 highway MPG with two-wheel-drive (2WD) and 15 city / 21 highway with four-wheel-drive (4WD). We covered over 600 miles in our Sterling Gray Metallic 4×4 Supercrew F-150 EcoBoost Lariat review unit and verified the official mileage estimates, achieving a respectable average of 22.7 MPG on the Interstate highway and 19.1 MPG combined in late summer weather. Temperatures ranged from the low-sixties through the high-eighties. Interstate highway testing temperatures were in the low-eighties. Our test unit was delivered with under 9000 miles on the odometer. The F-150 carried 300 pounds of payload in its bed during the highway fuel economy testing session. The 5.0-liter FlexFuel V8 is the standard engine in the 2011 F150 Supercrew Lariat. The EcoBoost V6 is a $750 option. Our test unit was equipped with the optional limited-slip 3.73 rear axle (a 3.55 non-limited-slip is standard), standard 18-inch aluminum wheels and P275/65R18 Goodyear outlined-white-letter all-terrain tires. Our F-150 EcoBoost completed the sprint to sixty miles per hour (MPH) in roughly 6.5 seconds. Not too shabby for a 4×4 Supercrew. The standard 26 gallon fuel tank provides plenty of highway driving range. Extended trips, whether on-or-off road, may call for the optional 36 gallon tank. All 2011 F-150s are designed to run on regular unleaded gasoline. The generously sized LCD Productivity Screen delivers the data, from off-road angles and towing info, to an innovative instant fuel economy display that helps you maximize your mileage with every gallon. The LCD Productivity Screen is standard issue in all F150 trim levels, with the exception o the XLT (where its bundled with the XLT Convenience Option Package). 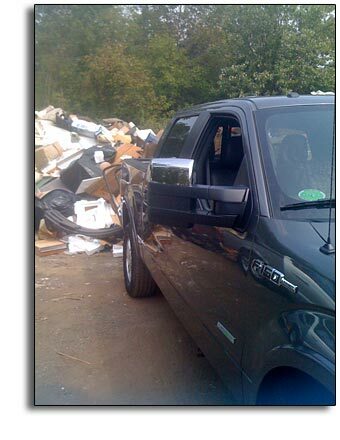 The F150 EcoBoost shined throughout its test period, as we endured the aftermath of Hurricane Irene. Needless to say, the truck was put to the task, hauling stuff from the waterlogged basement to the town dump. We were able to squeak in just enough time to get our footage shot. The well-appointed cab offered a welcome respite from the clean up work, with optional leather trimmed bucket seats equipped with two-way power lumbar support. Three-level heating and cooling helped keep the back pain and humidity in-check. In-cabin technology is top-notch. Microsoft Sync is standard, with all the Bluetooth and media integration goodness that entails. USB and audio input jacks are at the base of the dash, along side a 12-volt power outlet. Additional power outlets can be found inside the center console and at the back of the console, along with a 110-volt outlet, which for the record, was not capable of powering a sump pump. Our test unit was equipped with the optional Sony audio/Navigation package and Lariat Plus package, which includes a rear view camera and reverse sensing system. The F-150 Supercrew’s second row seats allow room for three, with 40.3 inches of headroom, 64.6 inches of hip room and 43.5 inches of leg room. The big guys will ride in comfort. From what I’ve read in your reviews, a chevy silverado 2500hd with the duramx diesel will get very close to the same mpg with more horsepower and a lot more towing capacity. Whether it’s the Ford Super Duty, Chevy 2500 Duramax, or Ram 2500 Cummins, you’ll pay (significantly) more for the attributes of the diesel engine. If you can make the case for a diesel, go for it. No argument here … Diesels rock.